Does the thought of entering a lift (elevator) turn your client's legs to jelly? Do they avoid entering lifts even if it means climbing several flights of stairs? Perhaps your clients feel claustrophobic or afraid that the elevator will break down and they will be trapped? We're sure your clients would agree that their phobia is irrational but that doesn't make any difference to their automatic reaction as it is their subconscious mind that has been conditioned to fear elevators or small spaces. This is why hypnosis is the ideal method to help your clients to reprogram their mind to feel differently. Overcoming a fear of elevators is achieved by bypassing the conscious, thinking mind during a state of hypnotic relaxation and using suggestion and visualization to help your clients to improve their thoughts, feelings and reactions towards this method of travel. During hypnosis your clients will be extremely relaxed and comfortable, feel totally safe and in an ideal state to accept suggestions that are for the benefit of their well-being. 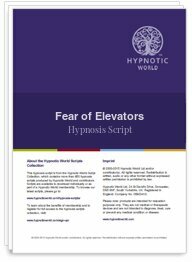 This Overcome a Fear of Elevators hypnosis script download uses visual imagery, positive suggestions and Ericksonian-style metaphors to enable your clients to relax and overcome their fear of elevators and enjoy the ride.